From now through August 22, they’ll be giving away gift baskets filled with natural dog or cat food, treats and coupons! 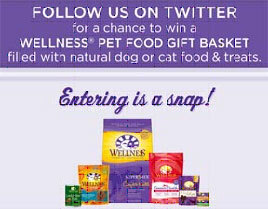 You can learn all of the details here and don’t forget to follow them @wellnesspetfood! Wellness Natural Food and Snacks for Dogs and Cats is available at pet specialty and natural food stores. To find Wellness near you, please visit our Store Locator.